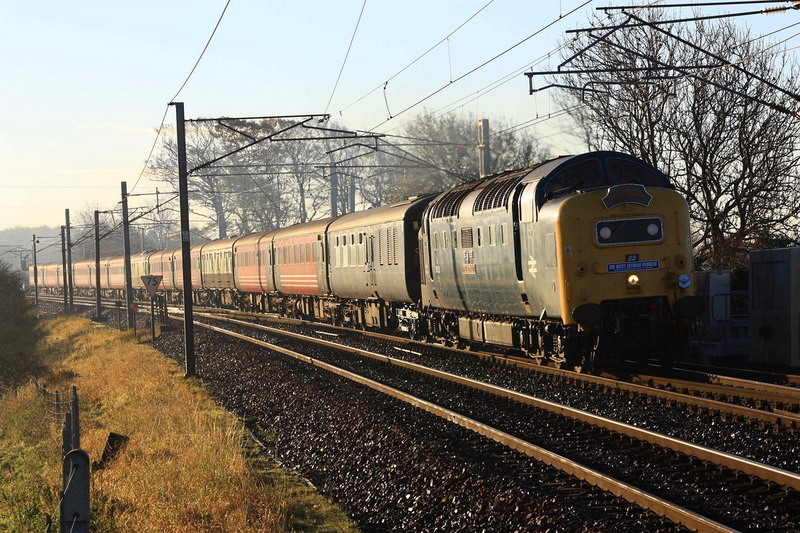 In low winter sunlight, 37676 and 37685 top Spitfire Railtour's trip from Birmingham Int. 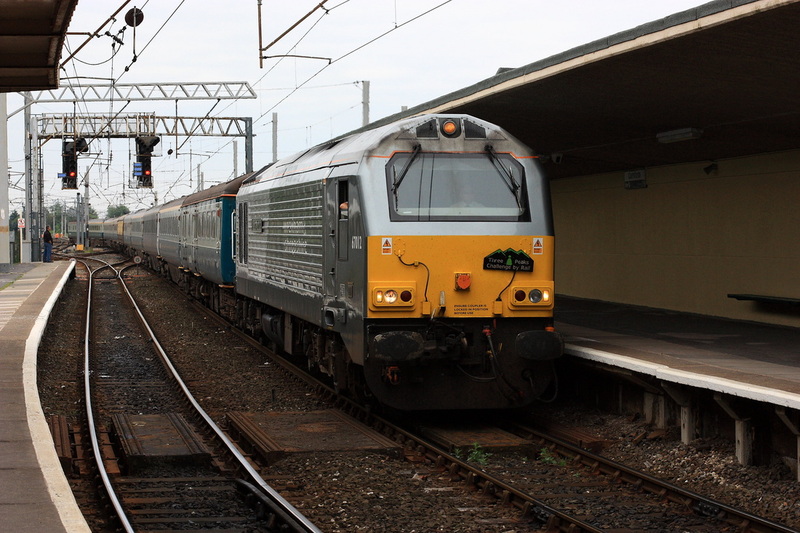 to Edinburgh on 5/11/2010. The sun had just appeared a few minutes earlier from behind the Trough of Bowland, to light the side of the train in a warm sunlight. The ecs working the previous day to Birmingham had, by contrast, left in torrential rain. 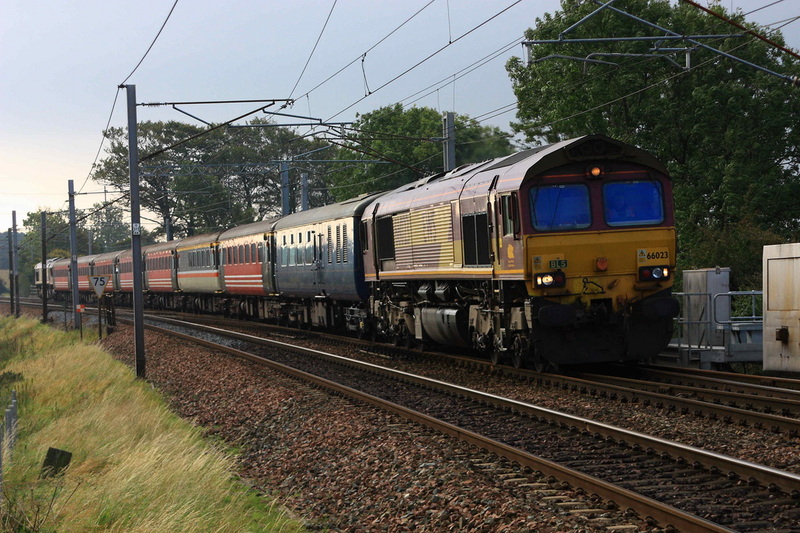 DBS 66s have featured on numerous occasions around this area this year, whereas in the past they haven't. 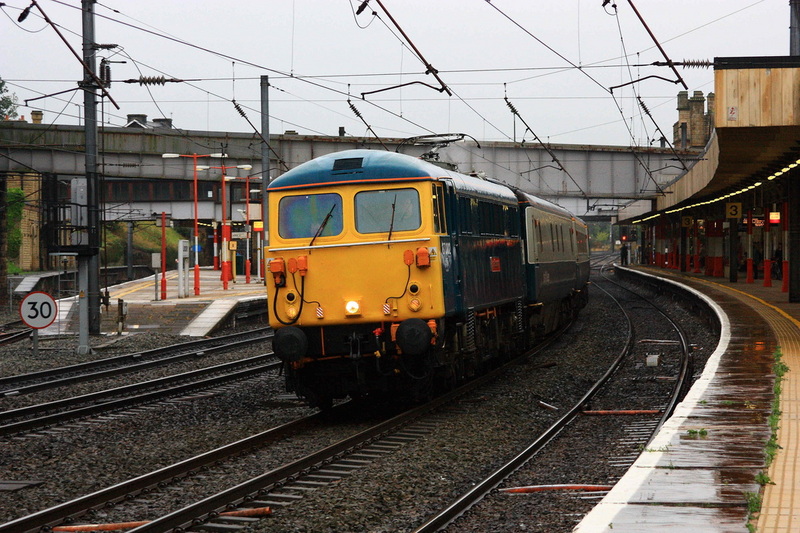 A Branch Line Society Charter ran to Barrow with 66023 t n t with 66066 on Saturday 9/10/2010. 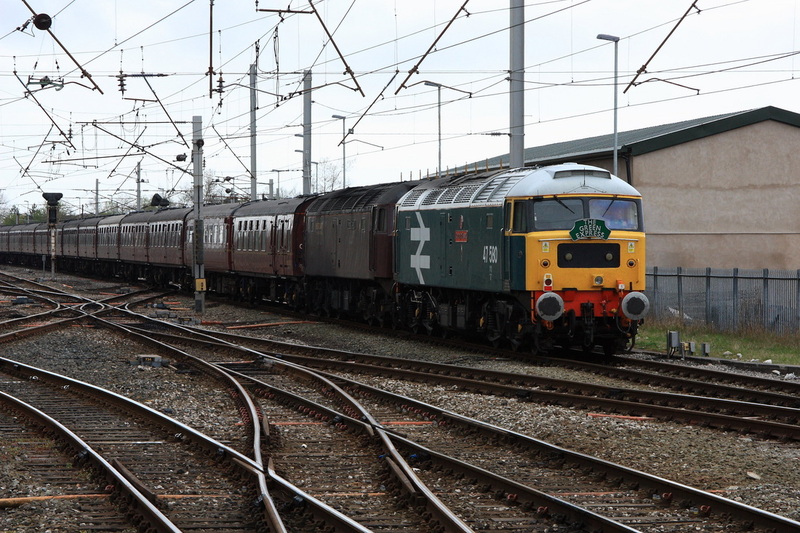 A returning 5Z11 ecs working heads back to Carnforth with 47500 leading Green liveried 47851 on Sunday 3/10/2010. 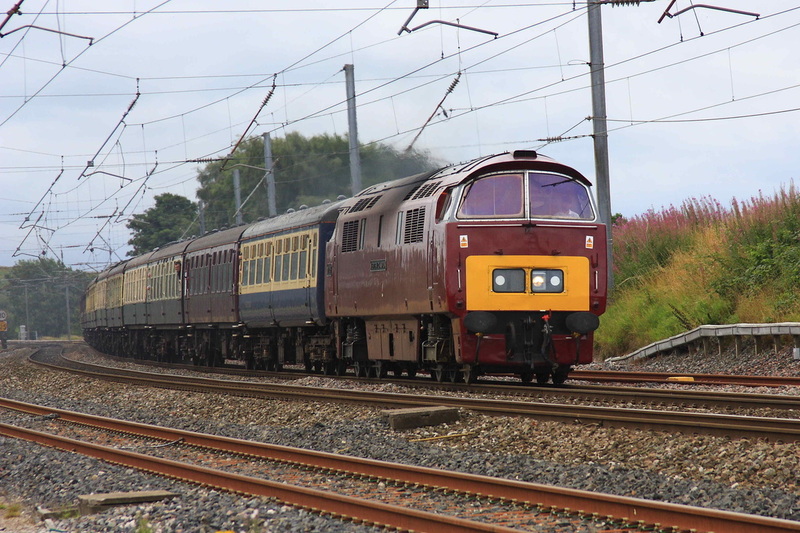 47851 did not have long to go before it too turned maroon! 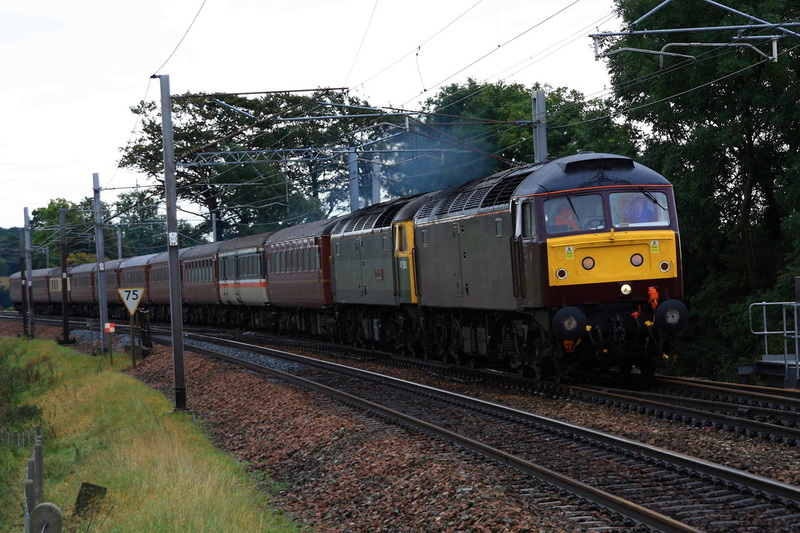 AC Locomotive 87002 worked a Watford-Edinburgh Charter on Friday 10/9/2010 through a damp Lancaster just after 10 am. 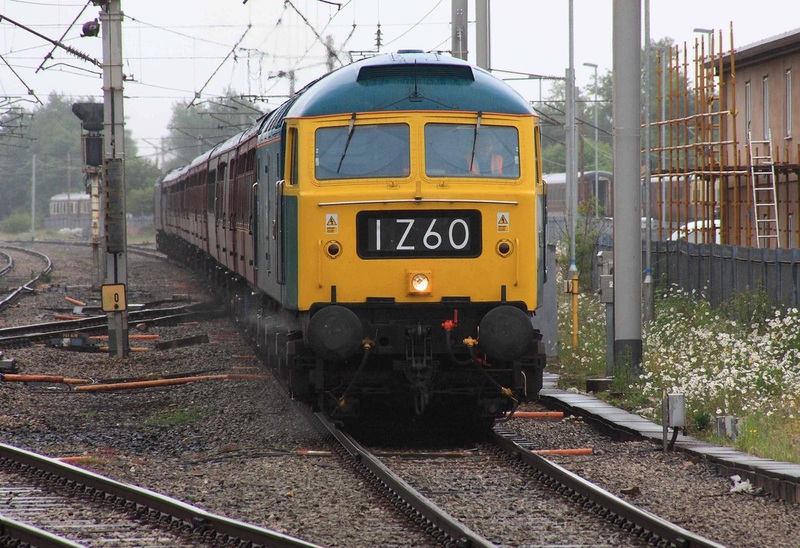 Just before this, 47851 and 37685 ran through light engine to Crewe, and Deltic 55022 ran light to Carnforth to work an ecs to Doncaster. 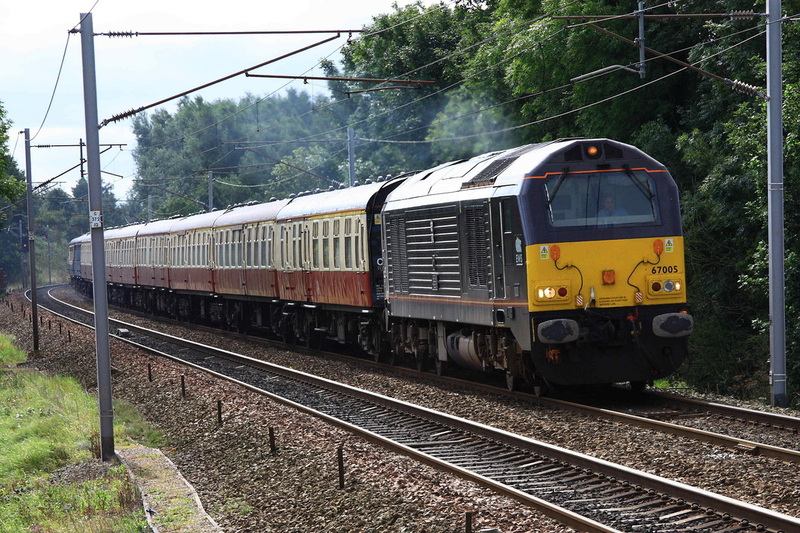 Royal liveried 67005 leaves Lancaster heading 1Z81 on Bank Holiday Saturday 28/8/2010, with an attractive rake of blood and custard stock, spoilt by a Blue coach which can be seen towards the rear of the train. 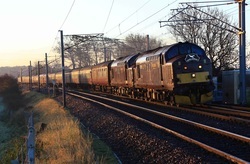 Sunday 1/8/2010 produced 2 sets of ecs returning to West Coast, Carnforth. 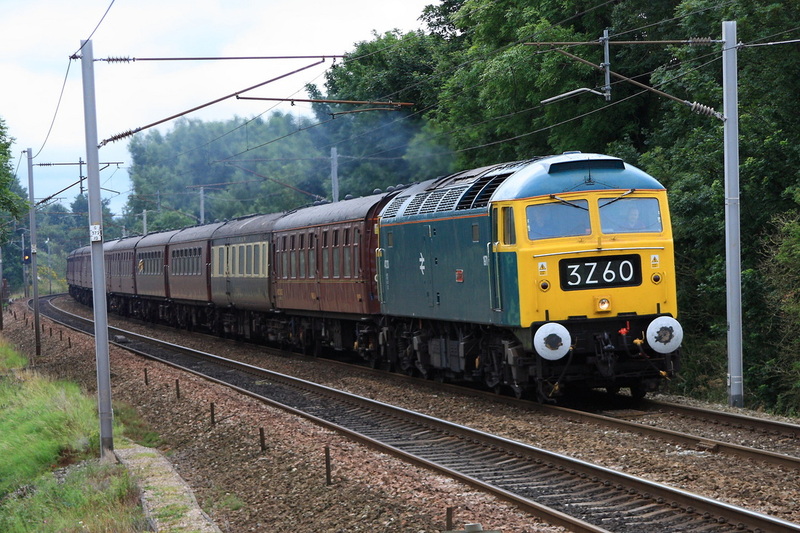 The first, 5Z60, was headed by BR Blue 47270 "Swift". 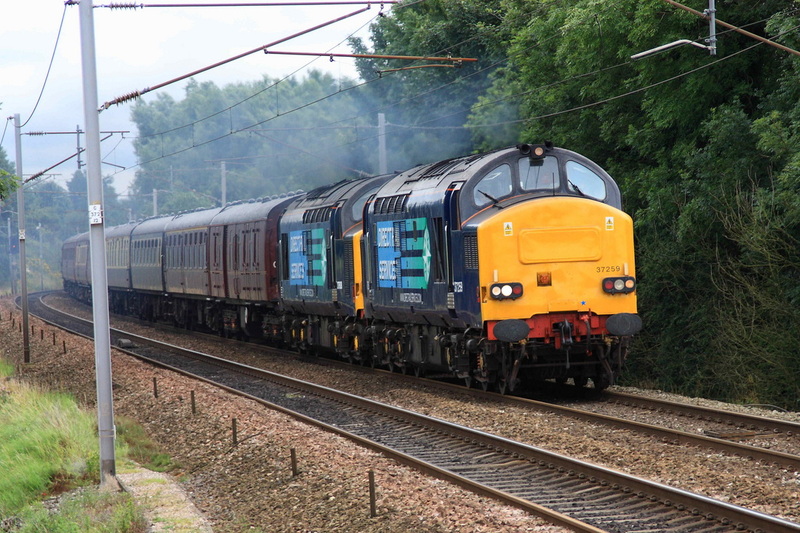 The second followed about 2 hours later with 37259 and 37608. 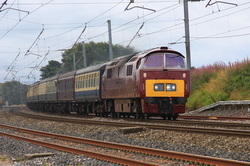 D1015 "Western Champion" passes Oubeck loops, south of Lancaster on 31/7/2010 with a charter to Carlisle. The return was via the S & C.
On this occasion, the loco carried the nameplate and number plate of former sister loco "Western Firebrand" (D1012) on the opposite side to this photo. 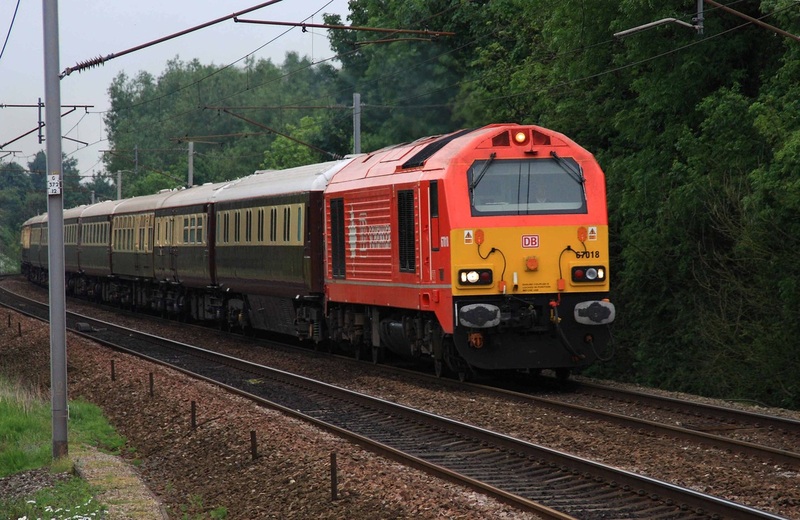 Before their demise, a Wrexham and Shropshire liveried 67012 leads 1Z21 "the 3 peaks challenge" into Carnforth heading to Ravensglass, the nearest rail point for the competitors to Scafell Pike. 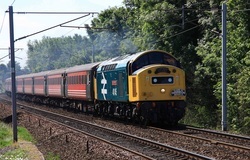 The date was Friday 25/6/2011, and the weather was a typical British Summers day, ie full dull! Purple 56312 (with 66148 as security) heads south on the return working Pathfinder Tours' 1z56 on Saturday 22/5/2010 in lovely evening sunshine. The location is again just to the south of Morecambe South Junction. 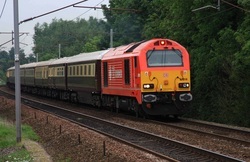 Large Logo 47580 was called to rescue West Coast over the weekend of 24-25/4/2010. 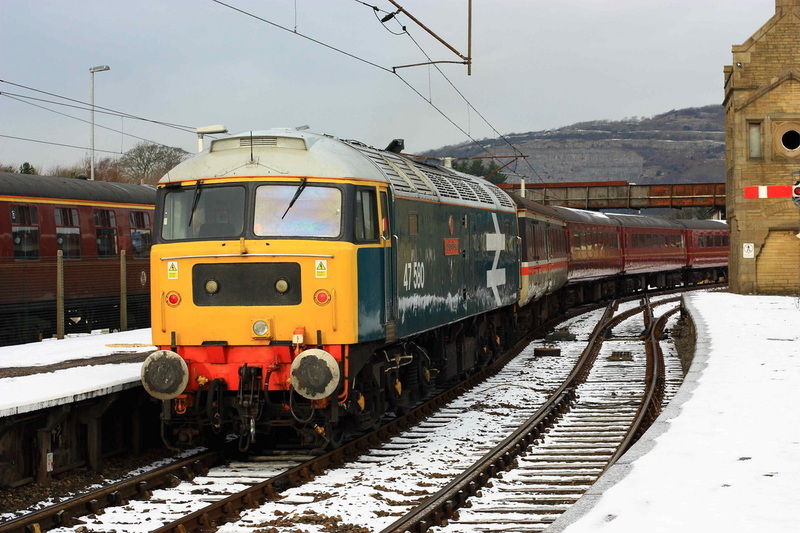 Unfortunately, 47787's engine had seized and was unable to carry on. 47580 t n t with 47786 to complete the trip, and then came back to Carnforth with the ecs.